Most of the insects found attacking stored rice are widely distributed geographically and found attacking many other commodities. These insects have been distributed around the globe through human movement and commerce. In rice, insect damage during storage can be the result of contamination, grain consumption or heating. Insect contamination of grain occurs when insects or their products (frass, webbing, castings) are found in the grain beyond a certain threshold of acceptance. 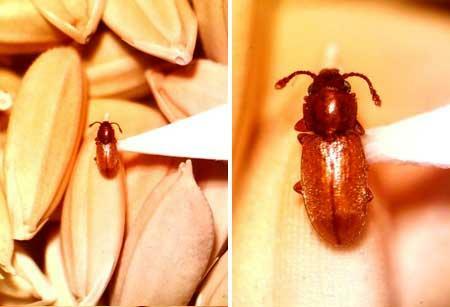 For example, the USDA’s Federal Grain Inspection Service considers a lot of stored rough rice as “infested” when two or more live weevils, one or more live weevils and one or more other live insects, five or more other live insects, or 15 or more live Angoumois or other live moths are found. Grain consumption by insects can be of significance when rice is stored during long periods of time and insect populations reach very high levels. Heating results from insect activity and can promote the development of fungi that can cause grain spoilage. EXTERNAL FEEDERS Insects that develop outside the rice kernel. These can feed on the bran, dust, broken kernels or mold. 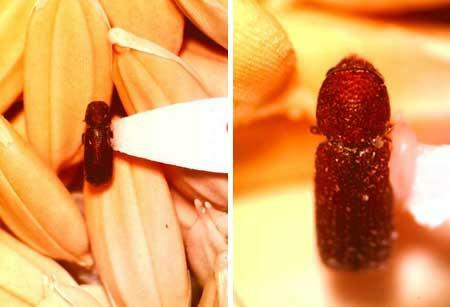 Female rice weevils lay their eggs inside the rice kernel. They use their mouth parts to chew a small hole in the surface of the kernel, where they deposit an egg. The hole is covered with a gelatinous material that hardens and plugs the hole, protecting the egg and later, the larvae. The larvae goes through four stages and then pupate inside the kernel. Adults emerge from the kernel once they are hardened and resistant to desiccation. Eggs of the lesser grain borer are laid on the grain surface. After hatching, larvae bore into rice kernels and remain inside until emerging as adults. Adults may stay within the kernel for a few days before emerging. 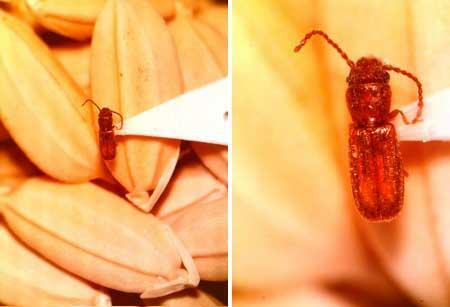 Both adults and larvae feed on rice kernels. Adults sometimes feed on kernels already injured by larvae, furthering the damage. Under heavy infestations, the grain can develop a sweetish, musty odor and can be extensively contaminated with frass. The Angoumois grain moth is the most abundant moth in rough rice storage. Eggs are laid on the grain surface. The larvae bore into the grain and develop inside. Before pupating, the larvae cut a small circular hole on the grain and covers it with webbing. The adults use this hole to emerge from the kernel after pupating. Adults do not feed on the grains. Usually, Angoumois grain moth infestations are limited to the top 10 or 15 inches of the grain mass, limiting the amount of direct damage this insect can do. 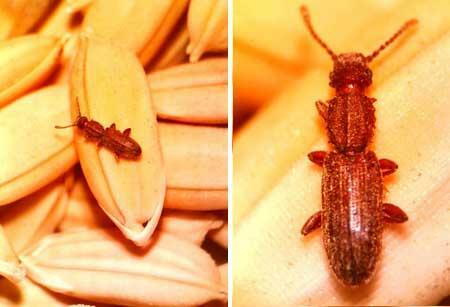 The red flour beetle and the confused flour beetle, two very similar species, can be found infesting stored rice. They both feed on bran, dust, brokens and flakes, but not on the endosperm. Adults lay their eggs on the grains, and larvae and pupae develop among the rice grains. Adults can live several months to several years. 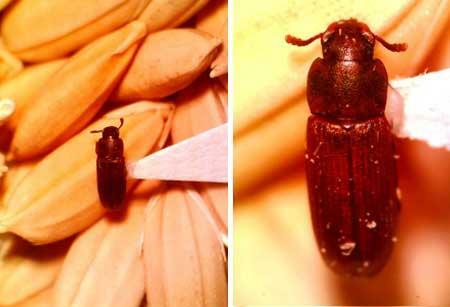 Although both beetles can be found infesting stored rice, the red flour beetle tends to prefer rough grains, while the confused flour beetle prefers processed grains. Adult females lay eggs on the surface of the grain. The larvae feed on the bran, ferm, falkes, dust or other small fines. When ready to pupate, the larvae leave the grain and seek a protected site to form a cocoon and pupate. Larvae produce silken threads and they move in the grain, which can result in webbing covering the surface of the grain under large infestations. The sawtoothed grain beetle is a flat, small beetle that has six characteristic sawtooth-like projections on both sides of the thorax. Adults lay their eggs in grain cracks or fine material. The larvae go through three pupal stages, after which they construct a pupal cell with food particles. Adults live six to 10 months. Several species of the genus Cryptolestes belong to this group. Adults are very small (1.5 to 2 mm); however, populations can reach very high numbers and their activity can cause heating, spoilage and contamination. Eggs are laid in the grain mass or grain cracks. The larvae develop in the grain mass, where they feed on small particles. Pupation occurs inside a silk cocoon, which sometimes can be found inside damaged kernels. These beetles prefer high moisture grain. 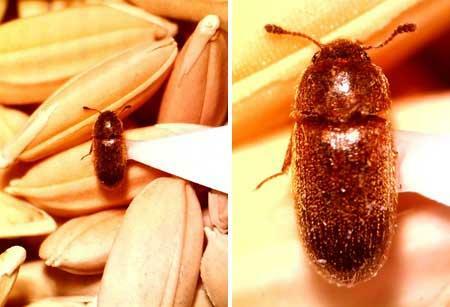 Adults and larvae of the foreign grain beetle feed on mold growing on grain. Eggs are laid on the grain mass and larvae go through four to five instars; they require high humidity for development. Pupation occurs in the grain mass. Presence of this insect indicates that the rice moisture content is high and that mold is starting to develop. 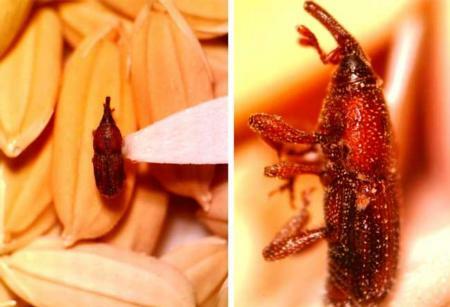 The hairy fungus beetle feeds on mold growing on rice and it is a good indicator that moisture content of the rice is too high or mold is starting to develop. They are attracted to hot spots within the grain mass, and their activity can contribute to the heating. These beetles are common in green rice stored on-farm right after harvest.